Adderbury is a village and civil parish located 3 miles (5 km) south of Banbury and 20 miles north of Oxford. The village has a population of approximately 3000 people and its parish church of St Mary’s is noted for its impressive steeple. Near St Mary’s is a tithe barn that was built for New College, Oxford mainly in the 14th century though English Heritage date the earliest parts of the building to 1422. It is here that the Adderbury Village Morris Men (AVMM) practice in the period leading up to Adderbury’s annual day of dance. During the nineteenth century, many villages in the Cotswolds performed a version of Morris dancing now known as ‘Cotswold Morris’. Like many other villages in Oxfordshire, Adderbury had a thriving Morris tradition but by the end of the century, Morris dancing appears to have declined in popularity and the Adderbury side finally stopped dancing during the 1880s. In the early part of the twentieth century a revival side was formed in Adderbury and they featured in the 1908 Empire Day celebrations in the village. 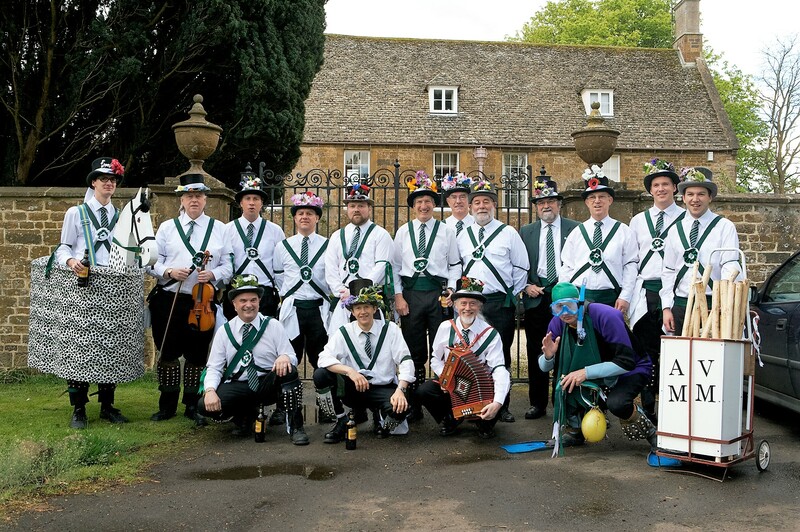 In April 1975, a group of dancers based in Adderbury began to perform the Morris dances of Adderbury again and forty years later some of the revival side dancers and musicians are still performing, joined by enthusiastic younger dancers and musicians. Adderbury Village Morris Men are always keen to welcome new dancers to help preserve the tradition. We recruit from Adderbury and adjacent parishes and new members are sure of a warm welcome. In 1976, AVMM featured on one the classic folk rock albums of the time, ‘Son of Morris On’ alongside members of Fairport Convention and The Albion Band. You can purchase of a copy of the CD from Amazon. In 2008, AVMM released a CD of songs, tunes and dances from the Adderbury Morris tradition entitled ‘Laugh, Dance and Sing’. You can order a copy of the CD from our bagman. Actor and film director Tim Plester was inspired to write a documentary about his childhood recollections of Morris dancing. Modern footage is interspersed with old recordings as it follows the lives of AVMM members. The film also traces the steps of the pre-World War One side. Tim comments: In 2008, I was invited to visit The Somme as a guest of the Adderbury Village Morris Men (a revival side which my Father and Uncle helped found); there to commemorate the lives of those village dancers who lost their lives in the stinking trenches of World War One. Of the young fresh-faced team that volunteered to fight for King and Country, only one was to ever return home again. Finding out about that Lost Generation of Morris men motivated me to write the documentary and to learn to Morris dance. IN 2011, ‘Way of the Morris’ a documentary about AVMM directed and produced by Tim Plester and Rob Curry was released. It had its world premiere at the SXSW film festival in Austin, Texas followed by a worldwide cinema release. The film also featured on Sky Arts. You can view the official trailer for the film above and purchase the film on DVD from Amazon. In addition to performing their usual opening and closing duties, a rich vein of Fairport runs throughout Cropredy. Members past and present appear in guest spots throughout the festival, most memorably during the performances of Richard Thompson and Ashley Hutchings’ Morris On. For sheer entertainment value, Morris On is unbeatable. Hearing this music as it’s meant to be heard; live, in the open air and with the sun shining, adds an extra edge of excitement. Add to that, Simon Nicol on vocals, the Adderbury Village Morris Men and The Belles of London City: you just can’t go wrong. If you’d like to view AVMM’s archive of photographs and video material do please visit the AVMM Facebook Page. We’d love to hear from you!